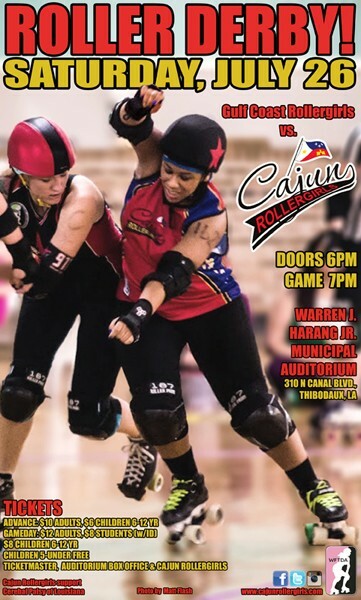 The Cajun Rollergirls flat-track roller derby will host the Lake Charles-based Lafitte’s Ladies, part of the Gulf Coast Rollergirls league, on Saturday, July 26, at the Warren J. Harang Jr. Municipal Auditorium, 310 N. Canal Blvd., Thibodaux. Doors for the event open at 6 p.m. with action set to begin at 7 p.m. The Cajun Rollergirls (5-1) come into the contest riding a five-game winning streak, with their most recent victory coming over the Cenla Derby Dames in a 228-84 victory on June 28 in Thibodaux. Cajun Rollergirls merchandise will also be available for purchase during the game, and special raffles will be held for cash and prizes. Children will have the opportunity to create their own unique posters to support their favorite skaters for $1 each. Following the game, Cajun Rollergirls skaters will be available for photographs and autographs. Discounted advance tickets for the event are available for a limited time at $10 for adults and $6 for children age 6-12. Advance tickets for all Cajun Rollergirls home games are available through any Cajun Rollergirls league member, through Ticketmaster or through the Harang Auditorium box office. Tickets at the door are $12 for adults, $8 for students with valid ID and $8 for children age 6-12. Children age 5 and under are admitted free. The Cajun Rollergirls are proud to partner with Cerebral Palsy of Louisiana for this game. Based in Marrero, La., Cerebral Palsy of Louisiana is an independent, nonprofit health organization which provides direct services to persons with cerebral palsy throughout the state of Louisiana. These services are provided at no cost to the client. Governed by a volunteer board of directors and comprised of staff and a network of parents, clients and volunteers from across the state, CP of Louisiana’s primary objective is to raise sufficient funds to provide services to all persons with cerebral palsy living in Louisiana. The organization has two upcoming telethons – a Bayou Area Telethon on the weekend of Aug. 2-3 at the Houma/Terrebonne Civic Center and a Lower Lafourche Telethon on the weekend of Aug. 23-24 at the Cutoff Youth Center. To learn more about Cerebral Palsy of Louisiana, call (504) 341-0676 or toll-free at 1-800-375-8275, or visit www.cerebralpalsyla.com. Founded in March 2008, the Cajun Rollergirls is the Tri-Parish Area’s first and only team sanctioned by the Women’s Flat Track Derby Association. Cajun Rollergirls is a nonprofit organization that aims to have a positive impact on both the lives of its skaters and the communities of Louisiana’s Cajun Country through the expansion of women’s flat-track roller derby. The Cajun Rollergirls foster the empowerment of women by promoting athleticism, sportsmanship, teamwork and volunteerism. In addition to increasing recognition of roller derby, the Cajun Rollergirls seek to support the community with volunteer work and fundraising, with a special focus on helping charities benefiting children. For more information on Cajun Rollergirls, visit www.cajunrollergirls.com or follow Cajun Rollergirls on Facebook, Twitter, Instagram and Pinterest. MEDIA NOTE: Media wishing to attend a Cajun Rollergirls home game or to interview league members prior to this game are asked to contact Aaron “PRmageddon” Looney, public relations chair, at publicrelations@cajunrollergirls.com or call 225-335-2613.